According to AP reports (see below), EMI logged it's first online sale of Sgt. Pepper sale 45 minutes after the performance at Live 8 -- my question is why did it take that long? 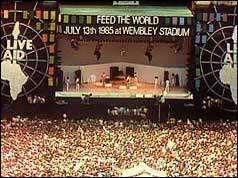 BBC ON THIS DAY | 13 | 1985: Live Aid makes millions for Africa (click through to watch part of the July 13, 1985 original video courtesy of BBC. LONDON (AP) — London Live 8's Hey Jude finale led by Paul McCartney was offered as a download Monday, while the concert's opening number was topping the online charts in several countries, the distributor said. The McCartney/U2 concert opener, Sgt. Pepper's Lonely Hearts Club Band, was No. 1 on the iTunes charts in Britain, Canada, Ireland, Netherlands, Germany, Italy and Belgium, said Adam White of Universal Music International. The track was also No. 2 in Spain and No. 3 in France.Universal said it logged the first Pepper sale just 45 minutes after the performance.